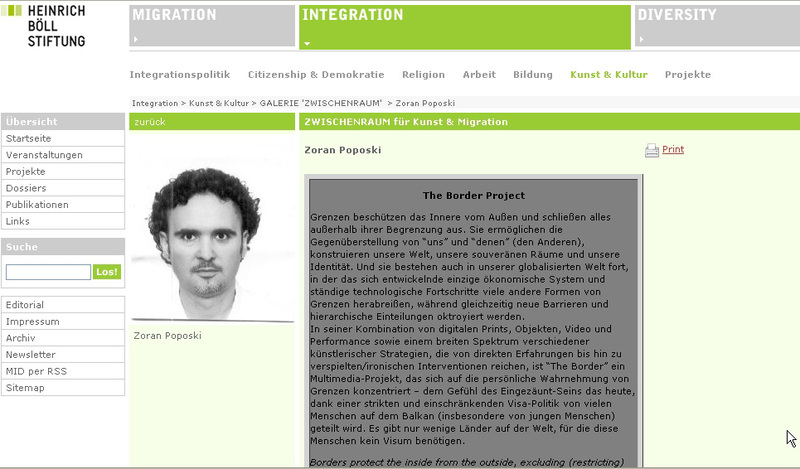 Zoran Poposki's Border Project is the feature of the month in the Galerie ZWISCHENRAUM für Kunst & Migration, an online project of the Berlin-based Heinrich Böll Foundation. Through video, performance, digital prints and objects, the Border Project explores the personal experiencing of borders (psychological, geographic, political, etc.) and their (im)permeability and arbitrariness in a globalizing world. 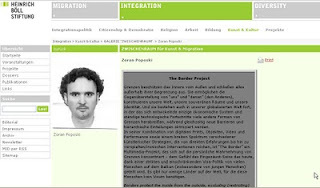 Guided by Homi Bhabha's concept of a "third space", Galerie ZWISCHENRAUM für Kunst & Migration presents new perspectives and artistic and literary forms of communication and expressing that deal with key issues related to diversity and explain migration from its various aspects of cultural identity, cross-border mobility and creative self-positioning.